As directed by the FEDERAL TRADE COMMISSION (see 16 CFR Part 255) – Guides Concerning the Use of Endorsements and Testimonials in Advertising, the purpose of this policy is to establish any compensatory affiliation between the site owner and third party websites, networks or merchants. Be aware that this website is part of a commercial operation and as such reserves the right to accept advertising revenue, sponsorship, or other forms of affiliate compensation, alongside premium listing fees. 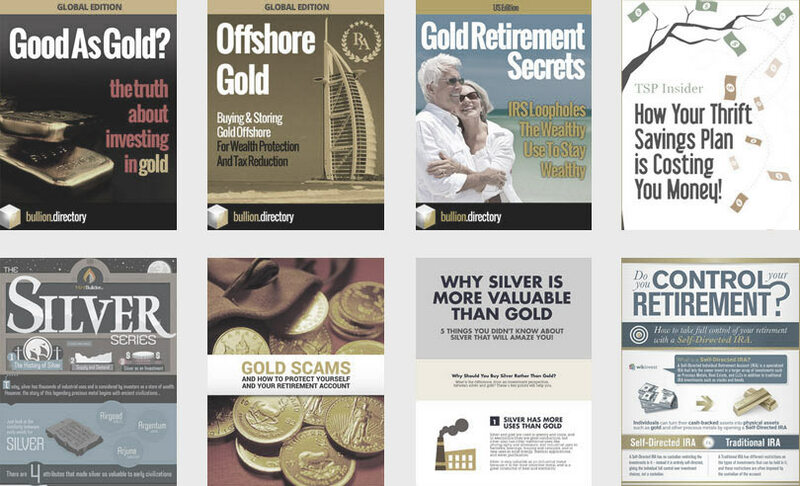 The operators of this website receive direct financial compensation from American Bullion, Bullion Vault, Cache Metals, GASFL, GoldBroker.com, Regal Assets, SilverGoldbull.com and Sprott Money. The content on this website, including positive review of these companies and other information, may not always be independent or neutral. However we strictly adhere to the company policy that advertising revenue, sponsorship, or other forms of affiliate compensation does NOT influence regular editorial content or user submitted ratings and reviews. Direct compensation will only influence advertising placement, directory listing locations and directory listing content. Other advertising revenue from automatically generated ad placements provided through the Google Adsense Program have no bearing on site content and we have no control over which companies are promoted in these placements. Direct advertising space will usually, but may not always be, identified as paid or sponsored content, however it will be designed to be obviously different to regular unpaid content. The visual appearance of sponsored editorial content is intended to be very different to regular editorial content and will feature a large logo of the compensating company at it’s head. Assume that content on sponsored editorial and advertorial pages is written in favor of and to promote the company compensating us for said content, and that by it’s very nature is biased towards the compensating company. When companies approach us to request a listing in our directory we may levy a fee to add certain listings to our system. This listing fee goes towards our time spent in adding the listing and our running costs for the site. Listings submitted for inclusion in our directory are split into free and premium listings with premium listings carrying a fee. Premium listings contain more information than regular listings and are listed ahead of regular listings in the directory when viewed in it’s standard mode. Third parties (bullion companies) may submit editorial content to this site and this content may or may not contain links to the company concerned and may or may not contain positive statements concerning the submitting company. We are not compensated for this content or have any vested interests in this content, other than receiving benefit from the increase in the site’s overall volume of editorial content. Third party editorial content will be clearly marked with the content’s author and related company name and link at the content’s head. The owners of this website and authors at this website, may at times be compensated through affiliate programs within editorial content which presents opinions on products, services, websites and various other topics. Any views and opinions expressed on this website belong to the author of the content. Any product claim, statistic, quote or other representation about a product or service should be verified by yourself with the manufacturer, provider or party in question. For the avoidance of doubt, trust and genuine impartiality are at the very heart of our directory’s business model and we will not alter our written editorial opinions in any way shape or form for money. You acknowledge that investing in precious metals involves risks and may not be suitable for everyone. You are therefore urged to consult with your own financial advisor(s) before making a decision. Past performance is not necessarily indicative of future results. Investing in precious metal(s) often involves a degree of risk that makes them unsuitable for certain individuals. You should carefully consider the suitability of precious metals as a personal investment choice before making any decisions that may affect your financial situation. Bullion.Directory makes no recommendations, projections, representations, or guarantees with respect to future prices, or performance of precious metals. Investment grade precious metals (bullion) are not FDIC insured. These are unregulated markets and as such they are not covered by the Financial Services Authority. Be aware that precious metals may lose value. You acknowledge that you are subject to a variety of risks, which risks are beyond the control of Bullion.Directory, and you also acknowledge that Bullion.Directory is not liable or responsible for those risks. Those risks include, without limitation, risks associated with the price volatility of the products, particularly precious metals. Under certain market or other conditions (such as technological or other disruptions), you may not be able to liquidate the purchased products or, liquidate the purchased products at prices acceptable to you. Investments and earnings derived therefrom have unknown risks involved and are not suitable for everyone. Making decisions based on any information presented on this web site or in any products or services provided through this web site, should be done only with the knowledge that you could experience significant losses or make no money at all. Only risk capital should be used.